Although Jamberry Nails remain my favorite nail wraps because they're gentler to remove than brands made of nail polish, I couldn't resist commandeering the Ama-Zen design from the Sally Hansen Salon Effects line. 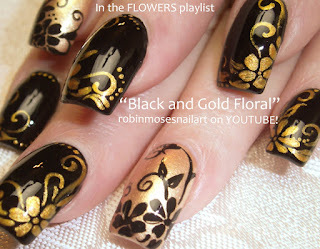 I wish I would have known about nail wraps before my pirate wedding back in 2012 - this flower nail art would have perfectly matched my black and gold bouquet, which you can see on my pirate postcard. Want to be a guest blogger for my Manicure Monday when I don't have new nails of my own to show off? Please contact me using the form on my contact page if you're interested in a free feature. 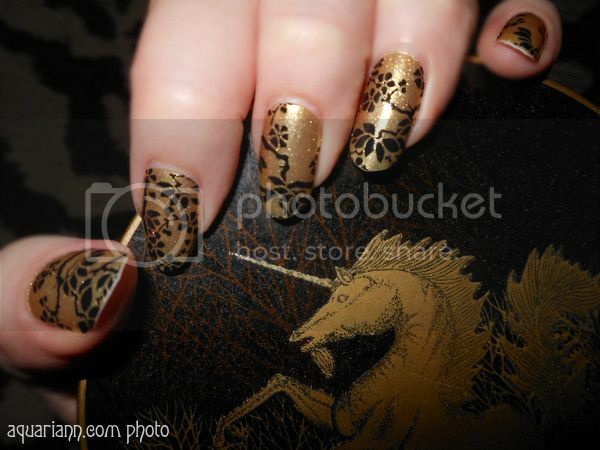 Or if you've done a gold manicure in the past, comment with the link and I'll add it to my featured finds below. These are beautiful! Black and gold works so well!! Black and gold nails are my favorite color combo! So cool. Love the design and the combination of sophisticated black on gold. Black and gold are very pretty together. So pretty! I think this would be great for a wedding, especially if they had it in silver.